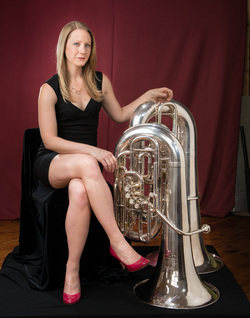 In addition to her duties in the Philadelphia Orchestra, Ms. Jantsch is a renowned tuba soloist. She gives solo recitals regularly, and has appeared as a concerto soloist with various ensembles, including the Philadelphia Orchestra, the Columbus Symphony, the St. Petersburg Symphony in Russia, the Henry Mancini Institute Orchestra, and the United States Marine Band. She has performed in Carnegie’s Zankel Hall with the Musical Olympus Festival, and has appeared on the radio on NPR’s series From the Top and Interlochen Public Radio’s Live From Studio A. In 2009 she was honored with a “Best of Philly” award from Philadelphia magazine. She has also won prizes in several international solo tuba competitions, and alumni awards from both Interlochen Arts Academy and the University of Michigan. Ms. Jantsch is in increasing demand as a teacher worldwide, having given master classes in Europe, Asia, and North America. She enjoys working with young musicians, and has been a featured artist at various brass festivals in Finland, Germany, Canada, and the United States. She is on the faculty at the Yale University School of Music and Temple University’s Boyer College of Music. Raised in a musical family, Ms. Jantsch began piano lessons at age six and began studying euphonium at Interlochen Arts Camp at age nine. After switching to tuba, she attended the prestigious arts boarding high school Interlochen Arts Academy, graduating as salutatorian of her class. She continued her studies at the University of Michigan under the tutelage of Fritz Kaenzig. After winning her position with The Philadelphia Orchestra in February of 2006, she returned to Michigan to complete her Bachelor of Music degree, graduating with highest honors. Ms. Jantsch can be heard on numerous Philadelphia Orchestra recordings, including the 2010 release of Ewald Quintets no. 1 and 3 with fellow Philadelphia Orchestra principal brass. She released her first solo recording, Cascades, in 2009. In 2013 she premiered Reflections on the Mississippi, a new tuba concerto written for her and the Temple University Symphony Orchestra by Grammy Award-winning composer Michael Daugherty. The recording of this work was recently released on the Temple University label, and during the 2014-15 season she will perform the concerto with the Philadelphia Orchestra, Albany Symphony Orchestra, and the University of Michigan Symphony Band. Carol is a Yamaha Performing Artist. She plays a Yamaha YFB-822 F tuba and a B&S Perantucci PT-6PS CC tuba. ​See more about Carol in our News.